I was in my freshman year of college in the spring of 2013 when I took my introductory Environmental Policy and Planning class. Although my professor covered a wide range of topics that fit under the umbrella of U.S. environmental policy, one lesson really stood out for me: her overview of environmental justice considerations in policy enforcement. She told the powerful story of Bayview Hunters Point, a low-income community of color in southeast San Francisco that had been home to a former naval shipyard and other industries that had polluted the area, severely impacting the residents. Despite decades of cleanup and redevelopment efforts, their struggle continues. I became inspired and emotionally involved in wanting to help other communities like Bayview. Growing up in the Washington, D.C. metropolitan area, I had witnessed instances of low-income and minority communities being plagued by pollution problems. I saw that for residents living in urban areas with aging infrastructure and minimal green space, the impacts seemed worse. I had considered myself a budding social justice advocate, but it was not until that day, that lesson, that I realized there was a vibrant, working movement to achieve justice in such communities. After that lesson, I had an epiphany about what I wanted to do with my career. Suddenly, all my papers for my other environmental classes incorporated discussions about environmental justice. I spent my free time searching the internet to learn more about environmental justice and how and where people were impacted. I wanted to talk about these issues with anybody who would engage in the conversation. I didn’t want to stop learning more. In my sophomore year, my interest in environmental justice led me to declare a Geography minor, so I could better understand the connection between social issues, place, and the environment. I want to learn more about the way that social geography impacts environmental decision-making in different places, to preserve local culture and adapt to be more equitable and sustainable. As I continue to learn, I keep challenging myself to learn more about the intersection of environmental justice and other related social issues, such as using ecofeminism as a framework toward global justice and planetary health. Learning about environmental justice issues as a critical component in policymaking decisions has inspired me to pursue it professionally. I want to ensure that a clean environment and good public health are not mutually exclusive. Being an intern in EPA’s Office of Environmental Justice and collaborating with other environmental organizations as a part of my internship has broadened my understanding of the amount of work that’s already being done to address environmental justice issues across the nation, as well as what remains to be done. Learning about environmental justice has helped me realize that people have the power to make a change in the world and help one another. Learning about environmental justice in a classroom setting has helped me realize that environmental justice and environmental policy should be intertwined. I am eternally grateful to my freshman environmental policy and planning professor for introducing environmental justice in the classroom, and my hope is that as time progresses, all environmental policy and planning programs in universities, and even high schools, teach their students about environmental policy and justice side by side. About the Author: Malavika Sahai recently was a Summer intern at EPA’s Office of Environmental Justice. She is studying Environmental Policy and Planning and Geography at Virginia Tech, and plans to graduate in Spring 2016. This Saturday, March 29th, is the 8th annual Earth Hour, a global movement that brings together millions of people across the world to switch off their lights for one hour as a symbol of their commitment to the planet. Are you up for the challenge? As a member of the team at ENERGY STAR, I am excited to participate for pretty obvious reasons. Turning off lights is a great and easy way to save energy and prevent climate change. Plus, using ENERGY STAR certified lighting saves energy even when our lights are on. This year, Earth Hour has partnered with the new Sony Pictures movie The Amazing Spider-Man 2 to make Earth Hour that much more thrilling to people across the globe. Check out this video to see how the movie stars are playing a part in protecting the environment this Earth Hour. The Boys and Girls Clubs of America (BGCA), a dedicated ENERGY STAR partner, is also working with the makers of The Amazing Spider-Man 2. BGCA uses the movie’s energy theme to help young people learn about saving energy. The movie villain is called Electro and he attacks by shooting bolts of electricity! The connection between the movie and the work of the BGCA is a great one, and one that I think works for young people across the country. What better way to get your kids to use less energy than by telling them to “Be Your Own Amazing” by joining Spider-Man to stop Electro and save energy, right? Even without the movie connection, Earth Hour is its own amazing. It is a way for individuals across the globe to come together to make a difference for the planet through local activities. And that speaks to us at ENERGY STAR, because we are passionate about using energy efficiently. Did you know that the average home spends about 12% of its electricity bill on lighting? Lighting accounts for more of the energy that you use than your laundry equipment, refrigerator and dishwasher combined. That fact alone should be a good reason to switch off the lights (non-essential ones) and give Earth Hour a try this weekend. We know that our kids want to be heroes like the Amazing Spider-Man. So by turning off the lights this weekend, we adults can certainly be our own amazing, too. Earth Hour will take place on Saturday, March 29th between 8:30pm and 9:30pm in your local time zone. About the Author: Jill Vohr is the Director of Marketing for the ENERGY STAR Labeling Branch. When she is not pursuing strategies that encourage individuals to use less energy – she is using up a lot of her own energy with her 7-year old daughter, Ingrid, who thinks spiders are icky. Toxic Soil Busters: Who You Gonna Call? When I first joined Toxic Soil Busters I cared about environmental issues, but I saw them as enormous and complex problems that were too big for me to tackle. My perspective quickly changed when I learned about Worcester Roots’ Toxic Soil Busters program, a youth-run cooperative that does remediation of soil contaminated with lead, sustainable urban landscaping, and environmental justice outreach. Before I started with the Toxic Soil Busters I considered environmental burdens, disparate health impacts, and a lack of opportunities for young people in our communities as separate issues. My experience in Toxic Soil Busters helped me understand how these problems are connected, and that any meaningful solution to these issues needs to address them holistically. Perhaps the best way that I internalized these lessons was through our outreach to communities affected by lead paint. Before it was outlawed in 1978, cheaper lead paint was used in households and apartments. Even though most of this toxic paint has been painted over, the toxic metal still can find its way into the soil and remain there for hundreds of years. Young children playing in the mud of their backyards are especially vulnerable as their bodies are still growing. Lead can affect the heart, bones, intestines, and kidneys, as well as the brain, where it can manifest as Attention Deficit Hyperactivity Disorder, behavioral problems, and learning disabilities. Rather than just try to clean up this dirty soil, Toxic Soil Busters takes a different approach. We empower youth by giving them the skills to combat lead in their own communities. For example, we are currently researching new ways to remediate lead-filled yards. Phytoremediation uses perennial plants such as geraniums, which soak up the lead and are then safely disposed. Other solutions include dilution through extensive composting, or reducing bioavailibility by using elements like phosphate. Young residents are at the forefront of our work in each case where we are working in neighborhoods to contain or remediate toxic lead soil. Inner-city kids – particular in the Worcester neighborhoods of Main South and Piedmont – often don’t have access to many opportunities, and are on the front lines of environmental threats. We build those opportunities, where they can learn job skills as they confront social justice issues. Additionally, as part of a movement of co-operatives, we support a local economy that can provide green, sustainable jobs to youth. Since Toxic Soil Busters started in 2006, we have remediated the yards of over forty homes, preventing future lead exposure and helping families sleep easy. We have seen far greater awareness of healthy homes issues in Worcester through our outreach, leading to more funding going towards these initiatives. Through our outreach, we have talked to hundreds of people, and thousands have heard our message. Some thirty youth have passed through Toxic Soil Busters, many going on to college and careers they didn’t even dream of when they first joined. There are many problems that are keeping opportunities out of reach for the youth in our communities. Worcester Roots has taught me how to aggressively approach these problems, and design holistic solutions to address them. I learned how to think like an entrepreneur and an activist, and the work I do for the rest of my life will be defined by my experience here. About the author: Asa Needle is Coordinator of Outreach and Education of the Worcester Roots Project, a non-profit dedicated to co-operative development, youth empowerment, and making neighborhoods safer for living, working, and playing. Worcester Roots Project runs cooperative-style social entrepreneurship youth programs with an environmental justice focus, including the Toxic Soil Busters. He furthers their mission of a just and sustainable world through collaborations with the Solidarity and Green Economy Alliance, Co-op Power, and Stone Soup Community Center. Labor Day is upon us. Nothing illustrates the end of summer better than seeing kids back at the bus stop in the mornings, and if my Facebook feed is any indication, kids across the country are already strapping on those backpacks and heading back to class. For many parents, this time of year brings a sigh of relief, as the whole family gets back to a normal schedule. But, the coming of the new school year can also mean the return to higher energy costs. Here are a few ways that EPA can help your whole family save energy, save money and help prevent climate change as you head back to school. These days kids of all ages use the computer to complete homework assignments, and your child will undoubtedly spend countless hours in front of the monitor. Make sure that your computer is ENERGY STAR certified, and you will use 30-65 percent less energy depending on how it is used. Take your energy-saving a step further and activate your computer’s power management settings. You can save up to $50 each year. The return to school may also mean the return to late nights spent studying. Make sure that your family is saving energy as the kids burn the late night oil by using ENERGY STAR certified lighting. Bulbs that have earned the ENERGY STAR use 75 percent less energy and last 10 to 50 times longer. Cool fact: If you placed an ENERGY STAR certified LED in your child’s nursery room today, it would last until they were in college. Do you have a student heading to college? Make sure they don’t forget all of the great energy-saving education you taught them, and be sure to look for the ENERGY STAR when outfitting their room. From TVs and soundbars to the mini-fridge and light bulbs, ENERGY STAR’s certified products have everything you need to make sure your student is being a good environmental steward, even when away from the nest. Did you know that school buildings can earn the ENERGY STAR? In fact, Demarest Elementary in New Jersey won the ENERGY STAR National Building Competition last year, reducing its energy use by over 50 percent. Check out this year’s competition, and work with your child’s school to save energy all year long. Saving energy leads to saving money, which will add up to an even greater education for the students in your life. Before the kids get too bogged down with homework, don’t forget to join Team ENERGY STAR! By joining the team, your family will get access to fun and educational resources from EPA to help make saving energy a lesson that lasts a lifetime. Brittney Gordon-Williams is a member of the ENERGY STAR communications team. Summer is winding down and for kids across the country, school is just around the corner (if it hasn’t started already). But as you run around buying new book bags and other school supplies, you may be pining for just one more fun activity for the whole family to enjoy. Well look no further because Team ENERGY STAR is the perfect way to end the summer! EPA knows that young people are great influencers when it comes to spreading the word about protecting our environment. That’s why ENERGY STAR teamed up with PTO Today, LG Electronics USA and the Boys and Girls Clubs of America (with support from Samsung Electronics) to teach the next generation how they can take action against climate change. With the help of the characters from the movie EPIC, Team ENERGY STAR teaches young people about saving energy in order to better protect the planet. You can join the team on ENERGY STAR’s website and get immediate access to fun and educational resources that teach the whole family about saving energy. Your child can take the EPIC Pledge and get the chance to bring home the newly available DVD of the hit movie EPIC! Teaching your kids about protecting the environment through Team ENERGY STAR will also make you eligible for rewards from LG Electronics. It may sound like a cliché, but today’s kids are truly our future. Engaging young people in making a difference today will make a big difference in securing a cleaner, more sustainable future. For the past two years Team ENERGY STAR has shown thousands of kids how they can help their family save energy and protect our environment. Sign your family up by September 30th, and end the summer with a great lesson that will stick with your kids for years to come. Brittney Gordon-Williams is a member of the communications team for the ENERGY STAR Labeling Branch. She does not have any kids, but plans on signing up her Goddaughter Victoria for Team ENERGY STAR. As students at the University of Michigan’s School of Natural Resources and the Environment we consider ourselves lucky to be part of an institution that has played a major role in the historic evolution of the United States environmental justice movement. Coming from different backgrounds, the four of us have found environmental justice to be a unifying passion. When we first encountered the Environmental Justice Organizations, Liability and Trade (EJOLT) project we recognized its potential to further global collaboration among EJ activists and scholars. The EJOLT project allows us to explore a wide array of environmental justice issues, giving us a richer understanding of what environmental justice is and how it’s been manifested in the United States. At the same time, EJOLT provides us with the opportunity to be part of an exciting new movement towards increased international collaboration in environmental justice. EJOLT is an international project that aims to map environmental justice conflicts around the world. EJOLT has reported on and analyzed environmental conflicts in more than 60 countries, including India, Ecuador, Mexico, and South Africa. 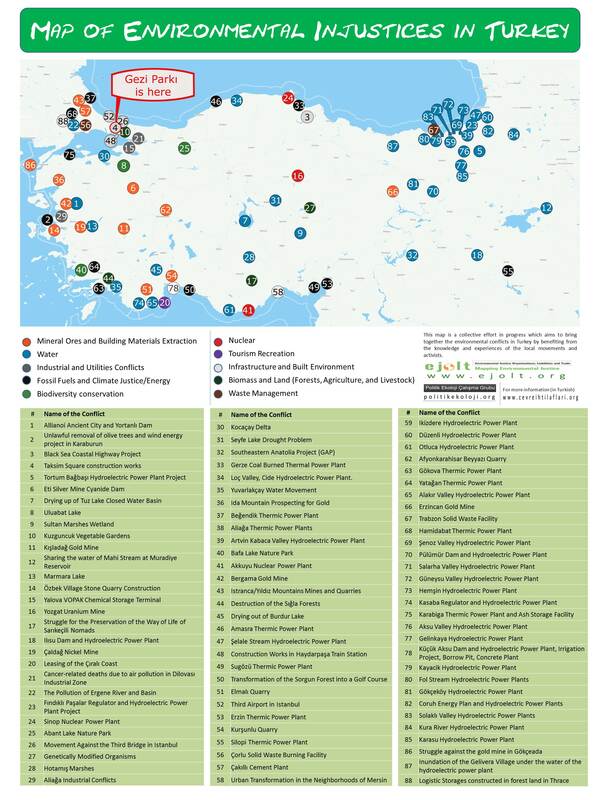 Cases like the Map of Environmental Injustices in Turkey have made headlines in mainstream media. However, environmental justice cases in the U.S. have not yet been integrated into this international effort. With the help of our two academic advisors, Professor Rebecca Hardin and Professor Paul Mohai, we reached out to the EJOLT project coordinator Professor Joan Martinez Alier and offered to spearhead an effort to identify and analyze 40 influential U.S. environmental justice case studies to contribute to EJOLT. This is where we need your help! Choosing 40 case studies to represent the environmental justice movement and its historical development in the United States is a monumental task. We decided to create a public survey that engages the wider U.S. environmental justice community and harnesses the expertise of scholars, activists, and citizens like you to help determine which case studies are included in this database. We need your help identifying which conflicts should be included in this project. If you would like to participate, please fill out our 5-to-10 minute survey. When answering the following questions, please keep in mind that we are not asking you to rank the case studies. All of the case studies have been divided into 10 categories defined by EJOLT. Each category also provides an option to write-in any case studies that are not in this survey, but you feel should be included. In order to make the survey shorter and more manageable, we have created two survey options. If you were born on a day ending with an even number please use this survey link, and if you were born on a day ending with an odd number please use this survey link. The survey will only be open through August 23rd, so make sure and take soon. Thanks for your collaboration! Alejandro Colsa is a Master’s student at the University of Michigan SNRE specializing in Environmental Justice. After spending some years learning how Environmental Justice is understood and studied in Europe, this Spanish graduate student has received a Fulbright scholarship to conduct research and study how the environmental justice movement was originated in the United States and how it can be framed within the broader and more international environmental justice movement, paying special attention to the role played by strong community activism. Bernadette Grafton is a Master’s student at the University of Michigan SNRE specializing in Behavior, Education, and Communication. She has a strong interest in brownfield redevelopment and community engagement that has led her to an understanding of the tight relationship between brownfields and environmental justice issues, primarily because of the location of many brownfield sites. Katy Hintzen is a Master’s student at the University of Michigan SNRE specializing in Environmental Policy and Planning and Environmental Justice. Her interest in studying the intersections between public policy and community activism stem from her time as a Peace Corps volunteer working on environmental conservation issues in the Ecuadorian Amazon. Sara Orvis is a Master’s student at the University of Michigan SNRE specializing in Environmental Justice. She is interested in the unique problems associated with rural environmental justice especially surrounding Indian Nations culture and traditions and the government to government relationships affect the mitigation of environmental justice sources. So begins Mayah’s Lot, the environmental justice comic book produced by my new research center—the CUNY Center for Urban Environmental Reform (CUER). I founded CUER in 2011 to connect my scholarly environmental writings with public service to my urban community in New York City. CUER promotes environmental democracy as a critical aspect of social justice, and supports communities seeking to participate in environmental decisions that affect them. With support from the CUNY Law School Innovation Fund, we began looking for non-traditional ways to bring environmental messages to a generation steeped in highly visual and interactive ways of learning. I especially wanted a message that would resonate with my very urban daughter and her friends—many of whom think of “the environment” as existing elsewhere, rather than where they live and learn. Our first project is Mayah’s Lot—an environmental justice comic book and video animated by Norman Dillon of Mothermin­d Studios. You can download the comic book here, or watch the video here. With Mayah’s Lot, we want to create an accessible learning tool for young readers and also to reach non-traditional audiences with an environmental justice message. We collaborated with graphic artist Charlie LaGreca of Comicbook Classroom and a group of middle-school students in Queens, NY, to develop a beautifully-illustrated comic book. Mayah’s Lot stands alone as a storybook, but it also provides valuable environmental justice lessons. Readers learn alongside Mayah, the young heroine, as she organizes her neighborhood to prevent a hazardous waste facility from coming into her already overburdened community. With support from CUNY Law, the Forest Service and the Greening Western Queens Fund, we are developing lesson plans for a range of grade levels that work with the Core Curriculum and are suitable for classroom adoption. These materials will be available from the CUER website. If you use them—and we hope you do—we ask that you let us know what you used and give us feedback on how it went. In fact, throughout this month, I have been using Mayah’s Lot in educational workshops with about 100 fifth graders at PS85 in Astoria, Queens and 120 sixth graders at PS122. Using a curriculum built around Mayah’s Lot, Charlie and I have worked with these students to cultivate their understanding of environmental law and environmental justice. We help them identify environmental problems in their neighborhoods and then the students create their own environmental justice comic book. The response from students so far has been terrific! About the author: Rebecca Bratspies, Professor, joined the faculty of CUNY Law in 2004. Her teaching and scholarly research focus on environmental and public international law, with a particular emphasis on how legal systems govern the global commons and how law can further sustainable development. Professor Bratspies spent a year seconded to the Republic of China (Taiwan) Environmental Protection Administration. Upon her return to the United States, she was a litigation associate with Dechert, Price and Rhoads where she worked with civil rights groups to bring two victorious class action suits challenging Pennsylvania’s implementation of welfare reform. Every time I brush my teeth, I still remember the first environmental lesson that I learned at school. I don’t remember who said it or when I heard it, but “don’t leave the water running while brushing your teeth,” is etched in my memory. Because of that lesson, wasting water has always been a no-no during my morning routine. Memories like this one make it easy for me to understand the power of educating young people about protecting the world we live in. Needless to say, I was incredibly excited to work on the launch of EPA’s Team ENERGY STAR this year. Team ENERGY STAR is a new component of the Change the World, Start with ENERGY STAR campaign, focused on teaching young people about protecting our climate by saving energy. EPA launched the Team ENERGY STAR section on our website this summer, allowing families to join the team and download educational (and fun) tools to help their kids learn about energy efficiency. We asked young people to come back to the website after they started helping their families save energy to share their story. The best stories were showcased on the ENERGY STAR Facebook page, with our social media audience picking the top story as the “People’s Choice.” Families could even go one step further and also join the DoSomething.org and LG Electronics Team ENERGY STAR Challenge. Team ENERGY STAR was a great success with thousands of families joining the team and learning more about saving energy in their homes. Hundreds of Boys and Girls Clubs (with the support of ENERGY STAR partner Samsung) across the country joined in by spreading the word about energy efficiency in their communities. It was inspiring to see so many young people making climate protection an important part of their everyday lives. Check out the Team ENERGY STAR photo album on ENERGY STAR’s Facebook page to see all of the top stories. Congrats to the “People’s Choice” top vote getter, Alexandra S.! Alexandra was also one of five top picks in the DoSomething.org and LG Electronics challenge, along with Bryce P., Caleigh G., Imelia G. and Renee L! Reading the energy-saving success stories from these kids showed me once again that young people can truly change the world. Are you interested in hearing more stories of young people making a difference? Check out our first-ever live Facebook broadcast on Tuesday, October 23, at 1:15pm CDT where we will have young people and adults from across the country sharing their stories live! Hope to see you there! Brittney Gordon-Williams works on the communications team for EPA’s ENERGY STAR program. School is just about out for summer, and for many kids across the country this starts the most wonderful time of year. Like many people, my memories of summer bring back some of my most favorite memories of childhood. From summer camps and vacations, to riding bikes with the kids in the neighborhood, my summers were filled with the kind of excitement that can only a child can truly appreciate. Many parents are probably finalizing their child’s summer plans right now, hoping to find that perfect balance of relaxed fun and intellectual stimulation. If you are looking for a fun and educational activity to help them fill their day, I have the perfect addition. Get your kids to join Team ENERGY STAR! This is an exciting new initiative from EPA developed to help educate kids about saving energy in order to protect our climate. This year EPA is working with Dr. Seuss’ The Lorax to help kids save the trees by saving energy at home. By joining Team ENERGY STAR your kids will have access to fun and educational resources that will help them understand the importance of saving energy. After they join, your kids will get access to downloadable resources to help them in their journey, including a comprehensive action kit, a Lorax Activity Booklet, a Lorax Mustache making kit and more. Your kids can even share their energy-saving story with EPA, and get it featured on our website and ENERGY STAR’s Facebook and Twitter pages. Several EPA partners are joining with ENERGY STAR on this project, including the Boys and Girls Clubs of America and Do Something.org. Our partners at Do Something.org are even hosting a Team ENERGY STAR Challenge that your kids can join to win prizes from LG Electronics. Check out Team ENERGY STAR at www.energystar.gov/team and get your summer fun started today! Brittney Gordon is a communications team member for EPA’s ENERGY STAR program. During the summer months she enjoys trips to the beach, great books and lazy weekends at home with her husband. About the author: Loreal Crumbley, a senior at George Mason University, is an intern with EPA’s Office of Children’s Health Protection and Environmental Education through EPA’s Student Temporary Employment Program (STEP). Across the globe, climate change has become a major subject of concern. A significant change in the Earth’s climate has caused the average temperature on the Earth’s surface to increase. This has become one of the most important issues of the twenty first century; and as young people, we play a major part in the fight against climate change. We are the future leaders of the world and the most threatened by climate change. Now is our time to take action and become leaders in this crisis by becoming Climate Ambassadors. You can become leaders and stand up to polluters by spreading awareness about climate change and how to reduce energy use and waste. Becoming a Climate Ambassador allows middle school and high school students to take charge on this important issue and inspire others to address climate change and children’s health. Motivating students to give presentations on climate change and children’s health to their schools, youth organization or other students. This will help spread information on climate change and motivate others to become active. EPA has created a presentation that students can use to increase climate change and children’s health awareness. Getting people in your community, your school or school district involved in ENERGY STAR pledges and challenges. The pledges and challenges encourage conservation throughout homes and schools. Recruit a leader from your community, school, or other organization to issue a climate change and children’s health proclamation. This proclamation will encourage youth to take action in reducing greenhouse gas emissions, conserving energy, and creating a new climate for action! Check out EPA’s sample proclamation. Since we are all contributors to climate change, we can all work together in creating a new climate for action! I think it is important for all us to come together and work towards creating a healthier environment. Because as you know, we are the future leaders and the future of our world lies in our hands. As young people, we will be the most affected; we need to step up and take a stand in creating a better world. Become a Climate Ambassador and motivate others to do their part for climate change and children’s health!